episil® is a preservative-free oral liquid used for the relief of pain caused by lesions, sores and other inflammations in the mouth, such as oral mucositis. The mildly peppermint flavored product contains a patented mixture of lipids that in contact with saliva form a protective film that relieves pain caused by ulcers and sores in the mouth without a numbing effect. Thanks to its unique and innovative composition, episil® liquid significantly relieves oral pain within 5 minutes and for up to 8 hours, and has no known side effects (Ref. 7). With episil® oral liquid there is no need for any mixing or measuring of medications before use. The product comes in a ready-to-use, pocket-sized, pump device, and can conveniently be applied right before meals (Ref. 9). episil® oral liquid is available in 2 package volumes: 10 ml (66 applications) and 3 ml (20 applications). One dose of episil® liquid (1-3 applications) delivers up to 8 hours of relief from oral mucositis pain (Ref. 7). 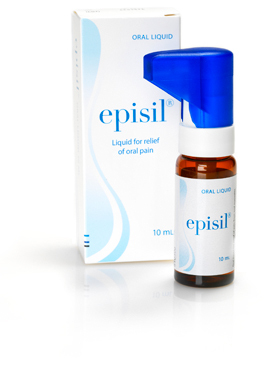 episil® oral liquid is used for the treatment of oral pain caused by oral mucositis. Oral mucositis can be induced by radiation and chemotherapy during cancer treatment. The risk is higher with certain types of drugs prescribed for certain types of cancers. It is also much higher if you receive both radiation and chemotherapy (Ref. 1-5).